If you haven't officially opened BBQ season, now's the time! The most difficult thing about making these is actually growing the veggies. We're so fortunate in the Willamette Valley that they're available at the farmer's market as well as every natural grocery in town. Since these are thin-skinned I stick with organic when I buy squash. In this case, we were lucky enough to score the yellow squash out of my niece's garden (thanks Jess! ), the pattypan and zucchini from the local farmer's market and the basil right from my sister's herb garden. I wrote this blog post while I was visiting family in Northern California. The grill was hot, the Imburgios were cooking and the kids were noisy. Does it get any better - or any more Italian? Okay, the olive oil, balsamic vinegar and basil had something to do with the Italian part. When you make this, cook plenty of it. I wish I had prepared more of the pattypan in particular. It was more popular than I expected and two little pattypans weren't nearly enough. The food blogger in me likes to think my 3 year-old nephew loved it because it's mildly sweet and, though thoroughly cooked, it was still firm (my brother did grill it perfectly). However, I leave room for the fact that pattypans look like flying saucers and he's in a Buzz Lightyear phase these days. Anyway, whatever you have leftover will be a terrific addition to summer salads and are really wonderful cold or at room temp. What a kick-off to summer! I was in Northern California among the grapevines and almond trees, looking for inspiration for the next recipe for the blog. Since stone fruit (apricots, peaches, nectarines, cherries) is at its peak there, it was a timely compliment to the pork loin roast. And they will be available in the Pacific northwest in a few weeks! 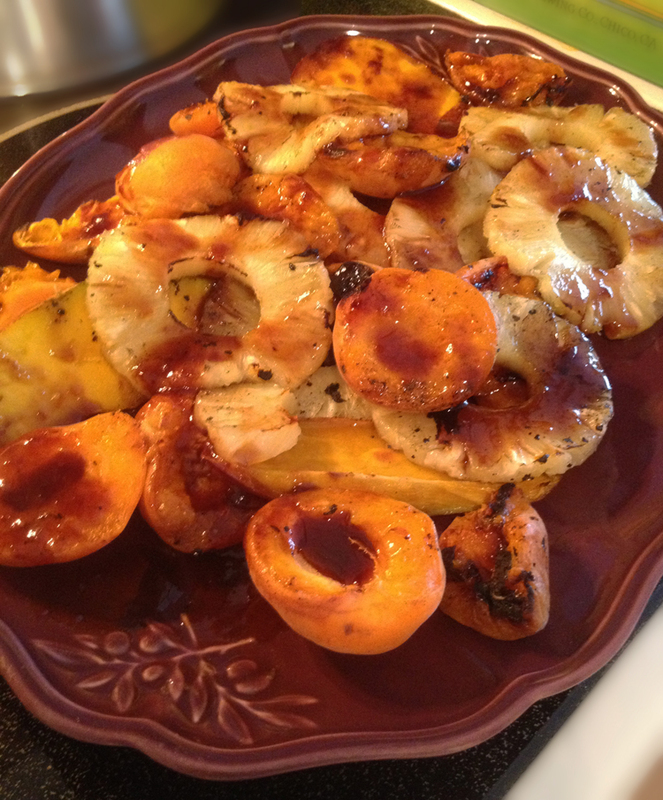 As you can see in this picture, the cherries never made it to the grill (they would have been in a basket) but the apricots, peaches, mangos and pineapple were a nice addition to the pork loin roast. If you've been reading the blog you've seen my agrodolce sauce on the chevre tarts. Here's another place to serve it. It enhances the flavor of a lot of different foods. I hope you try it. Time: 20 minutes to grill the fruit. Make the agrodolce 1 hour ahead. Yield: Serves 12 and is easily scalable to the size of your crowd. It's outdoor cooking season and time for my brother's smoky ribs. 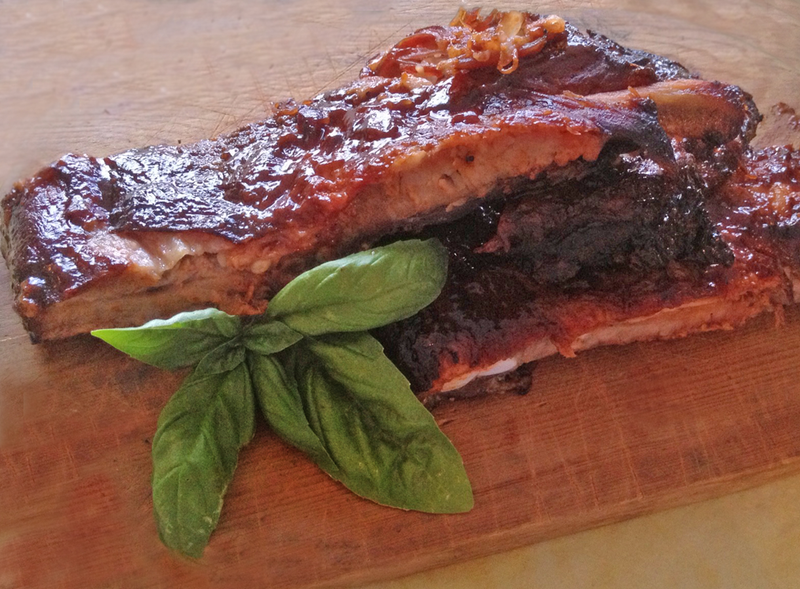 I was lucky enough to get Frank to blog with me and share the secret to making his moist and flavorful pork spare ribs. I'm guessing he would tell you that the secret is in the dry rub but I think it all starts with his insistence on using pork spare ribs, not baby backs or beef ribs. You must use meaty pork spare ribs for this recipe or risk that they will dry out. The next critical step is to get the dry rub just right. Frank knows by the color. It starts out quite red (chili powder and paprika) but the brown sugar and garlic powder change that. In the end, it's the dry mustard that turns it the rich amber color that you see below. You don't have to worry about that though, just follow the measurements and it will be spicy and delicious. The prep is easily done, you just have to be patient and let the cooking process take as long as it needs. Give it time. Find something to take your mind off the aroma because 6 hours of that is torture. Gather the family. Tell stories. Re-seed the yard. You've got time. 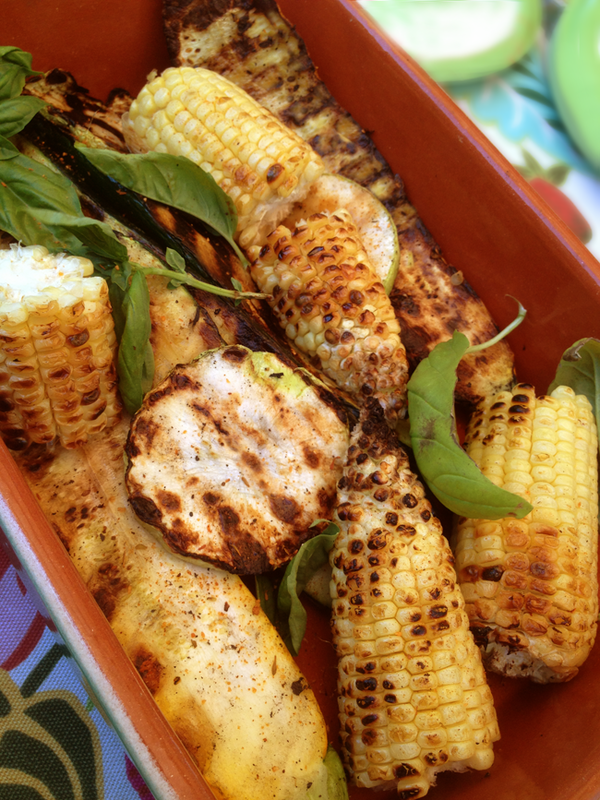 For this recipe you'll need a smoker. We used hickory chips but apple or cherry are also great with pork. Never having used a smoker myself, I was surprised by the amount of time it took to make them. Oh, was it ever worth it! Well, the warm weather is finally here and it's perfect for salad and, maybe, a cold beer. 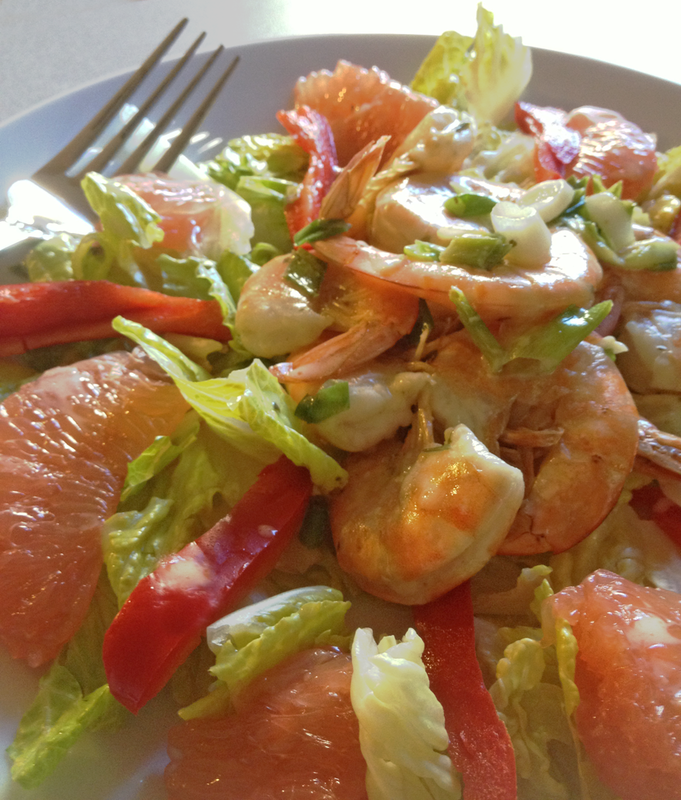 I've wanted to blog about this shrimp salad, a combination of many I've had in restaurants, for a while. A few attempts have been good but today I think I hit pay dirt! When I tasted Ninkasi's Spring Reign Ale this year, I was pretty sure it I found the ale that would work best in this recipe. And get this -- the shrimp only need about 1/2 cup. The rest is up for grabs! If you've read the blog you know that I like to cook with beer, but I generally drink wine with a meal. If you have guests that like wine, I would try a dry rosé with this one. The jalapeño, lime juice and beer make a tangy cooking sauce (or a baste if you're using the grill) and serve as a nice dressing for the salad as well. Choose your favorite organic greens and veggies but don't forget the ripest pink grapefruit you can get your hands on! 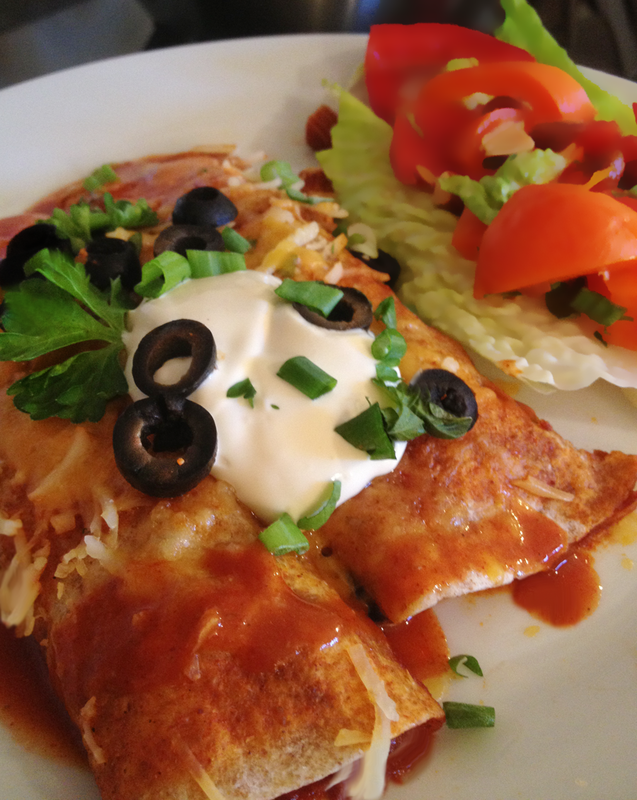 Looking for a quick and healthy dinner after a busy day? Try this. I've cut out the frying and a lot of the messy work. Also, I just discovered Sweet Creek Farms organic enchilada sauce and it's so good that even I don't feel bad about not making it from scratch! I realize that site visitors drop by from all over the world and this company is based in the Willamette Valley of Oregon (USA). If you can't find this product in your part of the world, I encourage you to look for a local company where you are. I hope you'll still make it yourself from time to time, though. It keeps it real when a cook makes the sauce from scratch. As promised in the name, this easy dinner will be on the table in an hour. If you already have leftover chicken, or if you're going meatless, it'll take half that time! You can make them to suit almost all tastes and it takes very little extra effort. Just remember to mark them somehow so you'll know which is which when you take them out of the oven. They aren't nearly as pretty when you have to pick through each enchilada to find the one for the kid who absolutely, positively HATES OLIVES! For me it was easy, "Two without meat, please." Notice the meatless ones pictured below are sprinkled with cheddar cheese. 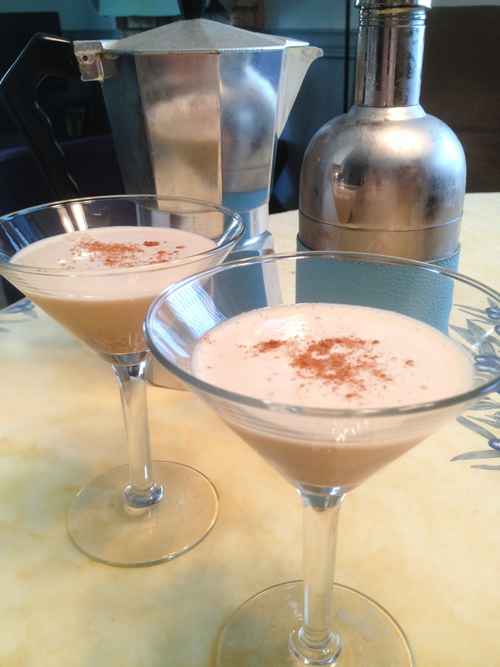 In case the sound of a vanilla cinnamon latte isn't enough, make this with a shot of espresso. It's great for dessert and not too sweet. I garnished it with a dash of Red Ape Cinnamon but you can get really fancy and sugar the rim of the glass. Combine the liquid ingredients and cinnamon in a cocktail shaker with plenty of ice. Shake well. Pour into a martini glass. Garnish with a dash of cinnamon.